Zooming away from Cancun as fast possible, since as everyone knows you can't get really good hot sauce in Cancun, we feel heated anticipation for the upcoming journey. The main drag from Cancun airport to the hotel strip is well traveled and will certainly not lead to the elusive "sauce of the Yucatan," possibly buried beneath centuries of overgrown jungle. We are in search of a recipe handed down for generations-one that mixes the Mayan and Spanish taste for things hot; in the midst of daydreaming, we suddenly realize that the upcoming turn is our last chance to avoid the dreaded hotel strip. Barreling onto Route 307, not knowing where it will lead us, we are relieved to see a sign that reads "Tulum, 115km." Heading south on the Yucatan peninsula, we pass one sleepy fishing village after another, each with its own archway hinting about hot sauces that may be hiding inside. Somehow, each beckoning archway seems not quite right. For example, in Puerto Moreles there is a sign pointing to a car ferry to Cozumel. Any place with a car ferry is bound to be too much of a main thoroughfare; then we notice that there is even what appears to be a mini building boom taking place. Time to move on. At Playa del Carmen, there are beautiful, long stretches of white sand beach, but as another mainland terminus of the ferry service to Cozumel, it has also been well-traveled and has developed quite a tourist trade of its own. We are now 60 km south of Cancun and there we find a truly beautiful beach hideaway. Paamul is a hideaway with a nice beachside restaurant and bar. We have a good meal prepared by someone who clearly knows something about hot sauce. We feel we're on the right track when he points south in response to our question about where we can find the best hot sauce. Encouraged, we head farther south on 307. A half-hour farther down the road we see an arch on our left and feel an inexplicable pull to the sea, and to what will prove to be a little slice of Yucatan heaven. This is place where pelicans rest on gently rocking, blue and white wooden boats, and where a crescent-shaped, palm-lined white-sand beach frames the sea. Protected from the open ocean by a coral reef worthy of its rating as one of the best dive spots in the Yucatan, the bay is perfect for swimming. Time stops as we sit in the open-air, thatched roof restaurant, listening to the palms rustling in the breeze. A dozen shades of muted blue, lavender and pink seem designed to entertain us with an ever-changing watercolor painting, while we sit in a state of suspended animation. The name of this paradise, Akumal, comes from its status among sea turtles as the beach of choice for nesting and egg-laying. The margaritas are superb, and the extra-hot salsa (we requested extra-hot) leads us to order another round. As the tequila enters our bloodstream, we realize that this will be home for the next five days. We ask our waiter in broken Spanish, "Is there anyplace nearby where we can buy hot sauce?" He directs us to the small general store just outside the whitewashed wall that demarcates the village square. There we find the hot sauce of the Yucatan, La Anita. 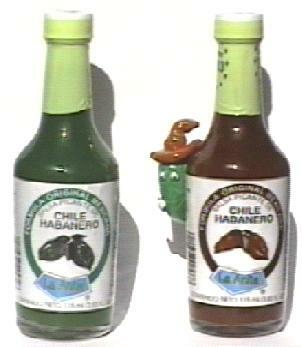 Actually, there are two hot sauces - a green and a red - both labelled "Salsa Picante de Chile Habenero". After five days of extensive testing on the local fare, washed down with gallons of margaritas, we decided that the green sauce closely edged out the red. It was close enough, however, that we vowed to return next year and continue testing.